It started with a simple walk, but it became so much more. As part of the many services offered, the Vancouver Hospice Society runs a weekly Bereavement Walking Program for those who have recently lost a loved one and are craving mutual support. 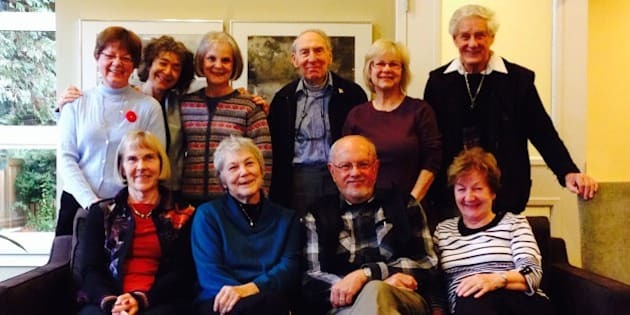 Started in 2005 by volunteers Sue Wong and—full disclosure—my aunt Sharon Harowitz, the walking program allows those left behind to find comfort and comradeship in others who are going through something similar. "You knew on Wednesday [walking day], you could see friends," says Barbara Clarke. "If you were happy, they were happy to share it. If you were feeling sad, it's no problem. They would be willing to listen to you. Your tears could flow if they had to. It was a really great experience. It's still a great experience." But for one group of 15 widowed walkers (including Clarke), the program has grown into so much more than those weekly walks. Even though these people all "graduated" from the Bereavement Walks after about a year-and-a-half (many credit seeing fresh grief in newcomers as the reason it was too difficult to remain in the official group), they struck such strong bonds with each other that they decided to continue. Every Wednesday at 10 a.m., they meet at Granville Island, and they walk. The connection now goes far beyond walking; the group has become their social circle. They celebrate birthdays together, they celebrate Thanksgiving and Christmas together, they go on vacations... Even the Oscars and a Royal wedding are a good enough excuse for these friends to meet up. "We laugh more with this group than we do anywhere else," says Carol Weinstock, adding that they now have "colour days" where they all wear the same colour t-shirts like kids at day camp. For two members, the group gave them a second chance at love. Marcia Nodwell and Dennis Nurse became friends while walking, and it slowly grew into more. They announced their engagement to the walking group first, and of course, the whole gang attended their wedding earlier this year. "This is like being with family," says Nodwell. "We know so much about one another ... This particular group, under any other circumstances, probably never would have become such good friends." But they are friends, and it's all thanks to the Vancouver Hospice Society. "This [program] was a godsend," says Otti Tomani, the most recent member of the group. The others agree. "I wish more people knew this type of experience was available to them," notes Elsie Wollaston. The society is getting ready to open up its first facility at 4615 Granville St. The building is ready, and they are in the midst of hiring their head nurse. Hospice executive director Geri McGrath hopes the new space will be ready in a few months. "These are very exciting times for Vancouver Hospice," she says.